The One Sculpin is a streamer pattern is recognized as “the one” as many believe it is the only sculpin pattern you need in your streamer box! The classic double bunny style helps the fly pulsate, while the dumbbell eyes help the fly sink. Hidden in between the bunny strips you will find a flashy red underbody and an articulating stinger hook. 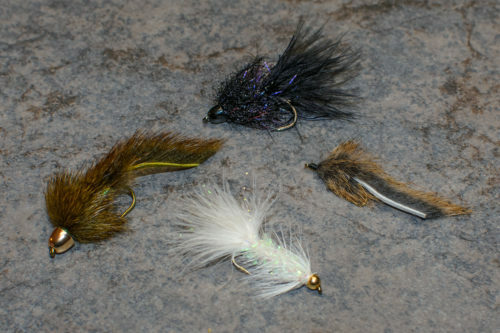 This is a simple and effective streamer pattern continues to fool trout with its realistic movement. Our favorite colors to fish are Black, Olive, and Natural. The One Sculpin is a streamer pattern is recognized as “the one” as many believe it is the only sculpin pattern you need in your streamer box! The classic double bunny style helps the fly pulsate, while the dumbbell eyes help the fly sink. Hidden in between the bunny strips you will find a flashy red underbody and an articulating stinger hook. This is a simple and effective streamer pattern continues to fool trout with its realistic movement and body taper. Our favorite colors to fish are Black, Olive, and Natural. This Sculpin pattern imitates a baitfish or minnow which provides trout with more bang for their buck and they rarely refuse the opportunity to eat one. You can swing, dead drift or strip it in and be successful. We typically fish this Sculpin pattern with a short leader terminating in 3X tippet. In most cases, we strip it with a traditional down and across delivery. We have found that a slow retrieve produces the best results, but don’t be afraid to think outside the box from time to time and mix things up with different retrieval rates. We have had success all over Colorado and Wyoming with this perfectly weighted Sculpin pattern.